Face a raised pull-up/chin-up bar, and, if necessary (due to bar height), either using a small stool or jumping, grasp the bar overhand (i.e. palms facing forward) at the desired width (traditionally a wide grip is preferred for this exercise) and hang. Note: If you have difficulty holding onto the bar you may use lifting straps. Raise your legs until they are parallel to the ground (i.e. your body is in an "L" shape--your legs should be horizontal and your torso should be vertical). This is the starting position. Pull your chest (or chin) to the bar, keeping your body upright and puffing out your chest, while exhaling throughout the movement. Note: Your elbows should be pointing toward the sides, not forward. Slowly lower your body to the starting position, letting your arms fully extend (without letting your elbow joint slam as your arms are straightened), while inhaling throughout the negative (i.e. lowering) motion. Repeat step 3-4 for as many repetitions as are desired. Once the set is complete, be sure to lower your legs from their raised "L" position, of course. Essentially, L pull-ups are a more advanced variation of standard pull-ups. They are a wonderful way to work both your abdominals and back at the same time. 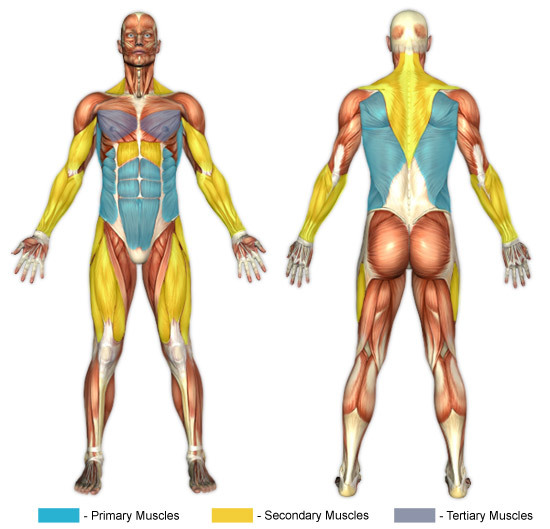 The primary muscles worked by pull-ups are the latissimus dorsi, teres major, and abdominals. Additionally, when the shoulder blades are squeezed together at the end of the movement, both the trapezius (lower and middle) and the rhomboids are recruited. This squeeze is necessary for the entire bulk of the back to be worked with this exercise. A wider grip will promote the width of the upper portion of the lats (thus creating or enhancing the often desired v-taper appearance) and is usually the manner in which the exercise is performed. A narrower group will involve the arms more - particularly the brachialis and brachioradialis of the biceps - but will still work the back to a great degree. A reverse grip can be used as well, but doing so will transfer a large amount of stress from the back to the biceps (particularly the biceps brachii and brachialis). See "Reverse Pull-Up / Reverse Chin-Up". Changing the width or direction of your grip will not affect the manner in which your abdominals are worked. To accomplish this, while still performing pull-ups, take a look at "V Pull-Ups". Copyright © Chunk Fitness, 2010-2019. All rights reserved. This website is for informational purposes only. Please consult a physician prior to starting any new exercise regimen.